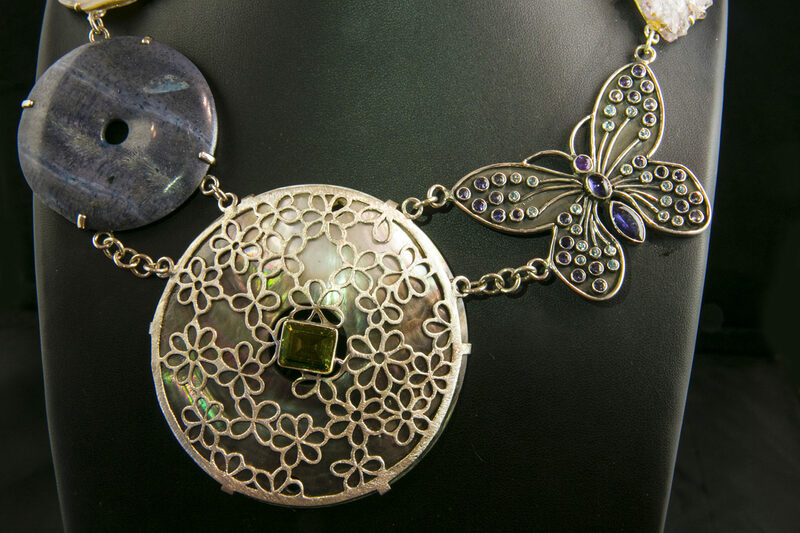 View cart “Morpho Butterfly” has been added to your cart. 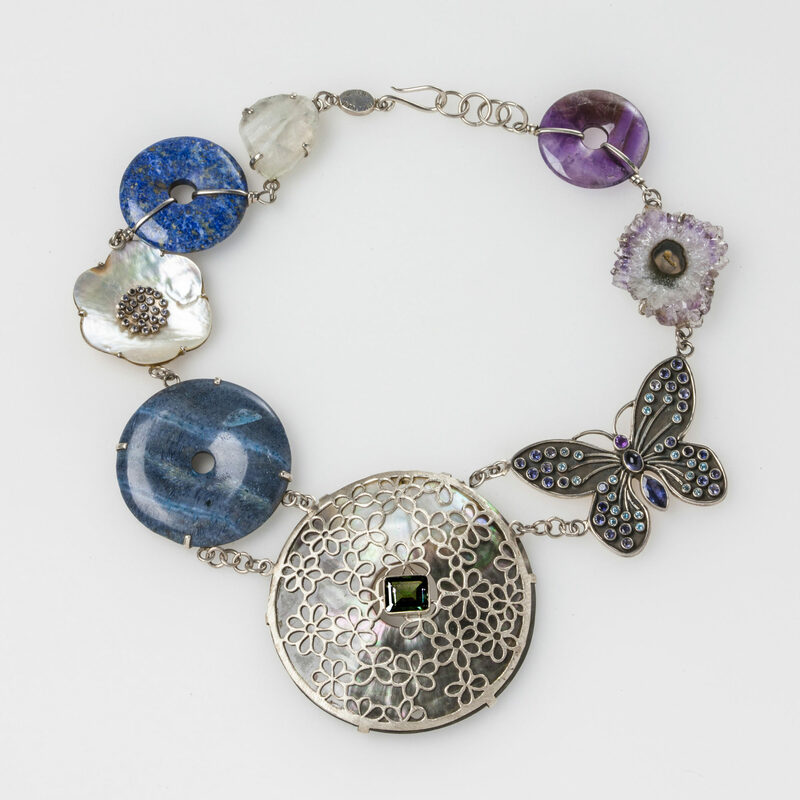 This is a beautiful necklace of blue and purple semi-precious gems (faceted blue topaz, iolite and amethysts set in a butterfly and Mother of Pearl flower) and faceted inky blue tourmaline in the centre of a silver floral disc overlaying a large Mother of Pearl disc. Supporting stones are amethyst crystal slice, amethyst disc, lapis lazuli disc and faceted moonstone set in sterling silver. 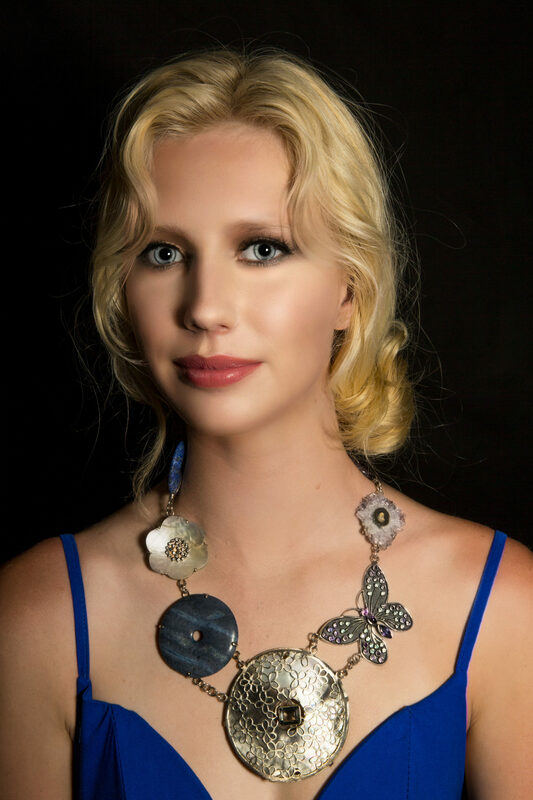 Jane Magon’s love affair with the Morpho butterfly began as a child. Many times Jane would be playing in her tropical garden in Port Moresby, PNG when the beautiful Morpho butterflies would ‘dance’ in the air past her. Morpho butterflies originate in many tropical countries near the equator and have remained as an inspiration to her to this very day. Jane associates their colours as iridescent versions of turquoise, tanzanite and sapphire and are amongst her favourite colours. 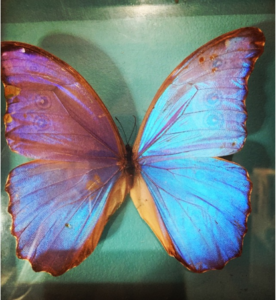 My love affair with the Morpho butterfly began as a child. Many times I would be playing in our tropical garden in Port Moresby when the beautiful Morpho butterflies would ‘dance’ in the air past me. Morpho butterflies originate in many tropical countries near the equator. They have remained as an inspiration for me to this very day (where I associate these colours as iridescent versions of turquoise, tanzanite and sapphire) and are amongst my favourite colours. In other cultures and periods of history, particularly Victorian England and Chinese culture, butterfly wings were set into gold and silver jewellery as if they were gems. I found it fascinating, enchanting and a little sad. However many cultures see the butterfly as a symbol, young love, eternal love – even of rebirth.